Smallpox is an infectious eruptive viral disease which is strictly limited to humans. It is a highly contagious condition which is transmitted either directly from one individual to the next one or indirectly through tainted items where the virus survives over a long period of time. Clinical findings include a rash with characteristic features and this condition has a stereotyped development over two week. The prognosis for healing is poor with many fatalities. When cured, survivors are protected for their life time. Before Jenner's findings, the fight against smallpox was rather unsuccessful as there were repeated outbreaks of the disease. In the early nineteenth century, shortly after the time of Jenner, the role of medical officers asserted itself very swiftly and from 1890 onwards immunization institutes were set up in the French colonies. The Colonial Army Medical Corps had a role which was essential as vaccination through scarification is very efficacious. A spectacular breakthrough was made with the development of a dried vaccine which within a few decades brought about the worldwide eradication of the disease. A few questions remain still unanswered regarding pock diseases which are due to related viruses. By the end of the symptom free incubation period, between 12 to 14 days, the disease starts with sudden shivers and a high grade fever (in the 104°), and with severe head and back aches. Around the third day the rash starts on the face and proceeds rapidly down the body. Pustules break and scab after drying leaving the patient with indelible scars. These blackish crusts are highly contagious material which can stick on different items and clothes. The fatality rate is between 10% to 50% of the sick according to the outbreaks. The disease, which has been known since the early times of history, spreads terror wherever it shows up. In past centuries outbreaks became more frequent with the development of expeditions across the world and with soaring numbers of individuals travelling. In the old days in China, prevention of the disease was attempted with the inoculating into healthy individuals of variolous vesicles dried crusts which had been collected from patients with mild cases : beside an ensuing risk of death this procedure contributed also to spread the virus. The best mean of prevention remained the isolation and quarantine of patients. Jenner* observed that women in farms who used to milk cows were resistant to smallpox after they had caught cow-pox : this disease of cow udders can be transmitted to humans and its clinical effects are only mild. In 1796 he gave evidence of the reality of this protection against smallpox with volunteers who had been inoculated with material from cow-pox lesions. This is how vaccination was discovered. Jenner's vaccination through scarification became progressively standard practice with the immunization of Napoleon's "Great Army" which was vaccinated at Boulogne Camp, and with him and his son also receiving the vaccine together in front of the public in 1811. As early as 1831, Chevreau started a vaccination campaign first in Algiers and then in all other big cities of Algeria. Medical Officers experienced major difficulties in implementating this vaccination campaign, since passing pustular material from the arm of an individual to the next did not always result in immunization and was also sometimes unsafe. In 1864 Chambon succeeded in obtaining vaccination material from heifers and then a medical officer by the name of Vaillard was able to set up in Paris, at the Val de Grace Hospital the first vaccination institute for the military which used vaccine pulp which had been preserved with glycerol. In spite of these efforts during the 1870-1871 war with Germany, immunization in the armies was not adequate as two hundred thousand smallpox cases occurred with twenty three thousand fatalities. Up to the end of the nineteenth century this condition was spread worldwide. Later on it became limited to tropical regions and then with the help of Colonial Army Medical Officers whose role was a decisive one, it started to subside before it could finally be eradicated. Their forerunners who were Navy Medical Officers had already started to undertake smallpox vaccination campaigns in Indochina and Cambodia shortly after their arrival. On Dec 26th 1867 a Vaccine Board was set up by Admiral de la Grandiere in Saigon. From 1860 to 1890 individuals were vaccinated with the "person to person" procedure which was provided in dispensaries or by travelling physicians. In 1890 a vaccination institute was set up in Saigon to which Pasteur and Roux assigned Calmette*. Unfortunately the vaccine which had been manufactured in France fared poorly with the heat, so that Calmette had to innovate with the development of a glycerol preserved vaccine pulp which had been prepared from buffalo skin and which was kept in sealed tubes. This shift from "the person to person" procedure to "the skin scarification" made vaccinations much easier. As early as 1891, 120 000 people had been vaccinated or revaccinated with this procedure which was then swiftly widespread across Tonkin and Indochina. This became much more feasible after 1904 with the availability of vaccination personnel, who had just earned their degree of "Indochinese auxiliary physicians". This entitled them to work as specialized native medical technicians. Multiple vaccination institutes had to be set up as, long distances, heat and also a need of large quantities of vaccine constituted major hurdles which had to be overcome to fight the disease. After the First World War, there were six vaccination institutes all across Indochina which were located in Saigon, Hanoi, Hué, Xieng Kouang, Vientiane and Luang Prabang. A boost to the fight against smallpox had to be given as the disease was still rife with flare ups. Mobile teams of health workers who belonged to the Natives Medical Service (AMI) were assigned to this fight. These teams were headed by physicians who had a district posting or by Indo-chinese auxiliary physicians. One decade after, smallpox had nearly disappeared from Indochina. In 1897 Thiroux* with the help of Clarac* inaugurated the Vaccine Institute of Madagascar. The last case of smallpox which was reported there, occurred in 1921. In French Occidental Africa vaccination institutes were set up by Marchoux* in Saint Louis, Senegal in 1895, by Martin* in Guinea in 1905, by Bouet* in Ivory Coast and Dahomey in 1908, and also in French Equatorial Africa by Kermorgant* in 1908. Just like in Indochina heat and long distances constituted major impediments to the vaccine stability. Both Joyeux* in Guinea in 1909 and Sorel* in Ivory Coast in 1911 strove to stabilize the vaccine but these attempts were not conclusive as the uneven quality of batches was still an issue. Fasquelle who had trained with Vaillard at the Val de Grace Hospital and who later succeeded Chambon at Paris Vaccine Institute made a real breakthrough with the development of the freeze-dried vaccine. As this dried vaccine is thermo-stable and as it could be carried anywhere in sealed tubes with no loss of its protective value, it took over the glycerol preserved vaccine. From 1919 onwards the Colonial Army Medical Corps decided on bringing this dried vaccine into widespread use in every colony and a global recession of the disease occurred after ten million doses were used each year. 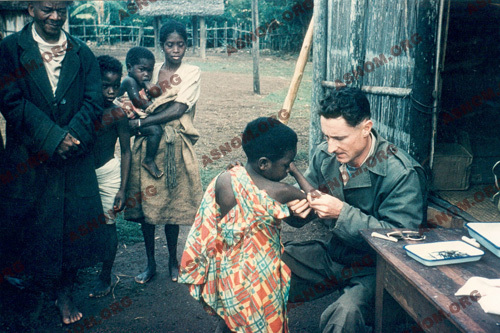 Many other regions of Africa had been left without any systematic vaccination program and this applies particularly to territories which were ruled by the United Kingdom and so across the whole continent the total number of smallpox cases between 1928 and 1966 fluctuated between 15 000 and 40 000. It peaked in 1943 and 1947 (55 000 cases), as this vaccination policy had been somewhat on the backburner during the Second World War. From 1939 onwards the Yellow Fever vaccine which was prepared with the Dakar strain was successfully associated to the dried smallpox vaccine. Systematic vaccination campaigns were run in rural areas by the Major Endemic Diseases Department and in large cities by Public Hygiene Services. 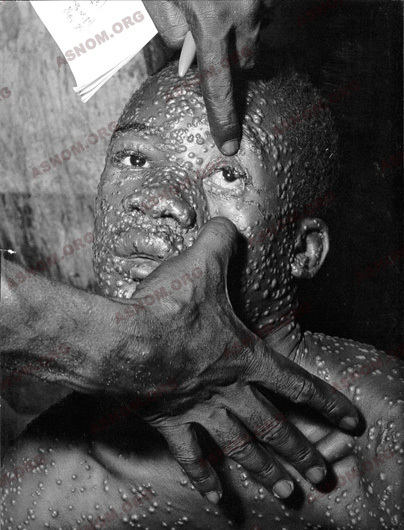 From 1960 onwards, smallpox started to recede everywhere and at the same time yellow fever as well. It remained confined to a few regions of Africa such as Ethiopia and Somalia and Bengladesh in Asia. In 1967 WHO contemplated its eradication with taking action in still infected regions and with a close monitoring of other regions. Pasteur Institutes and all physicians assigned to Major Endemic Diseases Departments took part in this eradication campaign and to the epidemiologic watch. The official acknowledgment of this first example of eradication of a worldwide disease took place in 1980 three years after the report of the last Somalian case of 1977 and this had been made possible with a truly archaic vaccine. Later smallpox vaccination was given up. 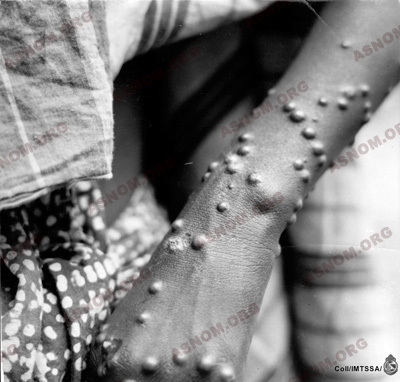 Since that time pox virus diseases have occurred among animals in the endemo-sporadic mode, such as the "Monkey Pox disease" also called "Monkey's smallpox". Despite the fact that so far there has been no identification of any threat, adaptation of this virus to humans or another pox virus should be considered as a possible risk for the future. Small outbreaks have been reported with a few human cases over the few last years. Clinical findings are the same as for smallpox but contagiousness and mortality rate are much lower. The epidemiologic watch has to be carried on at all times, all the more carefully that smallpox virus is considered as a most likely weapon in a bacteriological war. 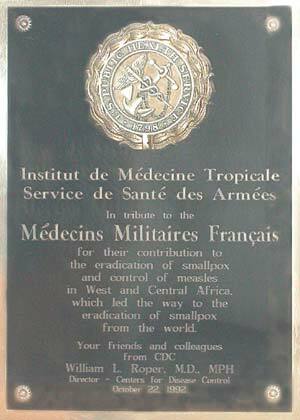 Eradication of smallpox was achieved by the work of all those involved in this action but medical officers of the Colonial Army Medical Corps and their co workers played a major role in Africa, in Madagascar, and in Indochina. One should be reminded of the tribute paid by the CDC in Atlanta in this respect. - Fasquelle R. Fasquelle J. : Vaccin desséché et campagne de vaccination dans les pays chauds. Bull. panamerican sanatary bureau. Washington, 1949,28,1118. - Fasquelle R. et Barbier P. : A propos de la dessication sous congélation. Sem. Hôp. Paris 1950,26,92,4762-4766. - Foege W.H. Miller J.D. et Henderson D.A. : Bull. de l'OMS. 1975, 52,209-222. - OMS.- Final report of the globalk commission for the certification of smallpox. Genève 1979. - Chronique OMS.- Courbe de cas notifié 1928-1966 sur 40 ans. 1980,34, p.43. - Breman J.G. Kalisa-Ruti, Steniovski M.V. Zanotto E. Gromyko A.I. 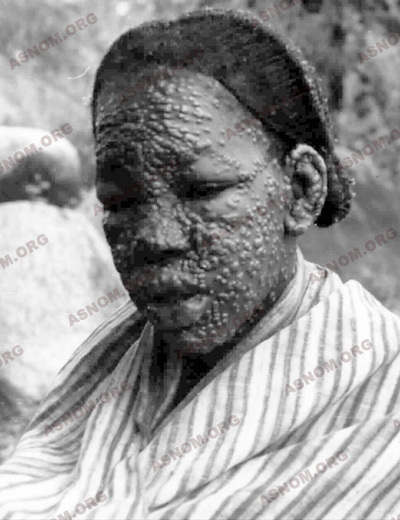 Arita I. : Le monkey pox chez l'homme 1970-1979. Bull. de l'OMS 1980,58,6,849-868. - Ferchal F. : Orthopoxvirus : variole et vaccine. Encyclo. Méd. -chir. Paris. Maladies infectieuses 8-050-j10-1995.